Richard Corliss is the previous Brussels New Generation chair and is now currently Vice President of the EU Committee. Read what Richard has to say about the chamber and what the advantages are for him and his company for being such an intrinsic part of the chamber. For more information on the Council nominations process and timeline, please follow this link. If you’re interested but want to know more about being a Council member, or standing for President, contact Glenn for an informal discussion. When I first came to Brussels, a number of colleagues working in Public Affairs told me how useful the chamber had been in building their networks in Brussels. So in 2006 I started attending chamber events run by the ‘Brussels New Generation’ (BNG) network for young professionals and the EU Committee policy events. In 2010, I became Chair of the BNG group within the chamber; a role that gave me a seat at the chamber’s Executive Committee. I saw this as a great opportunity to be part of the growing chamber platform and develop as a leader. This was a win-win-win – great for me, for the visibility of my company and for the chamber as a whole. Over four years, together we built an organising committee, broadened the scope of BNG activities to include networking and EU policy events, turned BNG into a key driver of the chamber’s CSR strategy, and made BNG a revenue contributor for the first time. I’ve been privileged to see the chamber from a number of different points of views; not only as a member of EXCO and Chair of BNG, but now as a Vice Chair of the EU Committee and Vice Chair of one of its task forces. Having seen and been a part of the chamber’s incredible growth during this time has put me in a great position, as a Council member, to support the chamber, adding value to our members and extending the reach and influence of the platform. 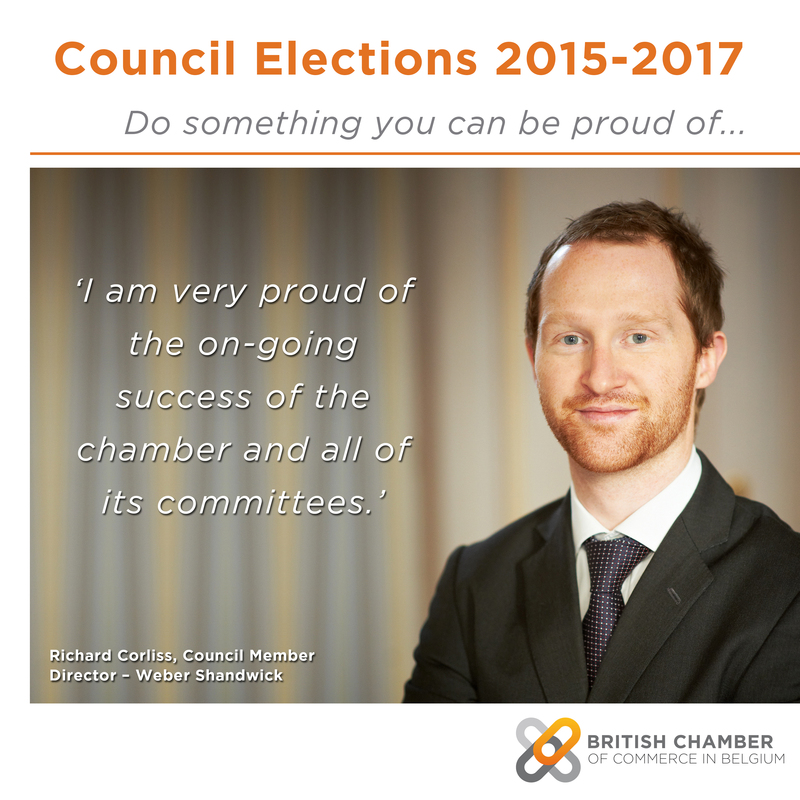 I am very proud of the on-going success of the chamber and all of its committees. Chairing a panel debate in 2011 on ‘British influence’ with two Directors-General of the European Commission was a particular highlight. But equally, developing the Great Brussels Bake Off and sitting on a judging panel with a three star Michelin chef was a unique experience that I treasure. These opportunities were made in collaboration with chamber colleagues and the chamber team. You really do get out what we put in.